One of the advantages of driving a rental car in the Hawaiian Islands is that you can comfortably transport the delicious produce sold in the islands' farmers' markets. The color, the fragrance and the quality of the markets is unequaled. The fruits and vegetables, however, tend to be a bit larger than mainland produce. The convenience of a car is handy when you get ready to leave the market for your accommodations. Additionally, if you carry an ice cooler in your rental, you can keep your beautiful purchases fresh until you get back to your AirBNB, resort or other accommodation. 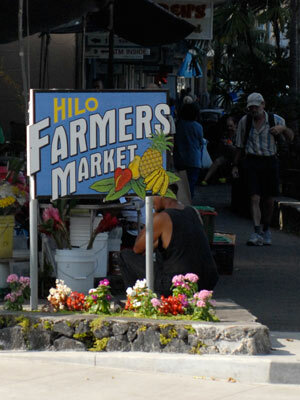 Throughout the Hawaiian Islands you will find Farmers' Markets. All of them have beautiful bouquets of flowers and luscious produce. You'll find some are quite diverse and include booths with fresh seafood, coffee, vegetables, local honey, tropical fruit, jams and jellies, as well as baked goods. You may even find locally produced herbs. Several of the larger markets include craft booths. Each market is unique in what it offers and how sales are conducted. Some adhere to strict opening times, while others follow loose hours. Be sure to check your travel guide book or local websites to find where markets are located and the hours they will be open. Each island has online information for the markets. Bring change and shopping bags to make transactions easier for the vendors. Most of all--- have fun discovering the bounty that local farmers, florists and craftspeople have to offer. On the big island there are farmer's market 7 days of the week. 5 Markets. 3 are open daily. 2 Markets. Held Tuesdays, Fridays or Saturdays. 2 Markets held on Saturdays. 6 Markets. One is open daily. Others are open weekends and some weekdays. 4 Markets. Mostly held on Sundays. One held each day except Sunday. Most open in the afternoon. Most fun-- No selling until rope goes down and then customers run for booths. A wide variety of produce plus seafood, breads, pastas, tropical jams and jellies, and flowers. Weekday markets held throughout the island.